Athletics closer Blake Treinen was named to the 2018 MLB All-Star team. After greatly underachieving with the Nationals, as many players seem to, Treinen has found his groove in Oakland. Let me lay this out right off the bat: this 2018 MLB season, in many ways, has been brutal to watch. For all the dreams of parity the 2015, 2016, and 2017 seasons inspired, 2018 has been the royal kick in the groin back to reality. The Red Sox and Yankees are the superior teams of the American League. The Cubs and Dodgers appear on a collision course to meet in their third straight NLCS. The fairy-tale seasons of the Braves, Phillies, Mariners, and especially the Brewers hit major roadblocks in the first half’s final week. But there is one team that is quietly ascending, and it may be one of the best stories in baseball no one is talking about. Bob Melvin is already building a strong case for American League Manager of the Year, an award he has previously won twice (in 2007 with Arizona and 2012 with Oakland). He is seemingly doing it with smoke and mirrors, but make no mistake: his team has not only had a tremendous, overachieving first half, it has also stood toe-to-toe with the league’s elite teams. At 55-42, the A’s sit three games back of the equally-surprising Seattle Mariners for the second AL wild card spot. That is no small feat when you consider the A’s were 34-36 after 70 games, meaning they have gone 21-6 since. 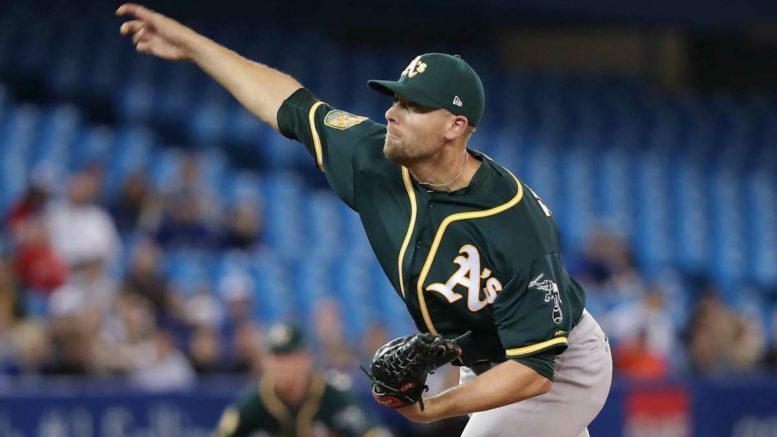 It was a whirlwind week for the A’s, who are also one of baseball’s best road teams with a 31-21 mark away from the Coliseum. For the second time in 2018, Oakland completed a 10-game roadtrip at 7-3. It’s fair to debate which one was more impressive; back in mid-May, the A’s went 3-3 on the road against the Yanks and Sox before sweeping four in Toronto; this most recent one involved taking two of three in Cleveland, three of four in Houston, and two of three across the bay in San Francisco. Outside of going 0-6 at home against the Astros thus far, the Athletics have been incredibly resilient against the cream of the crop. They are 4-2 against baseball’s best team, the Red Sox, winning both series against Boston. Sean Manaea’s no-hitter on April 21 was the pinnacle of that success. They are also 4-2 against the Indians and 3-2 combined against the Dodgers and Diamondbacks. Take away their home misery against Houston, and the A’s are 19-17 against teams currently in a playoff position. And, as good teams often do, they have taken advantage of the soft spots in their schedule; they are 25-4 combined against the Orioles, Royals, Tigers, White Sox, Blue Jays, and Padres. It’s easy to dismiss that word and that notion, but if you want evidence of where the mental aspect of baseball can wreck teams, look across the country to the nation’s capital. For every accolade you want to heap on the “little engine that could” A’s, the inverse is true of the Washington Nationals. The Nats are, in my opinion, the most painful team to watch in baseball. Yes, more so than the God-awful Orioles and Royals, more so than the plodding White Sox, Tigers, and even Padres. There is so little to like about the Nats that you just wish they moved back to Montreal (plus, life without those wonderful Expos hats in baseball is just so boring). Beyond the terrible broadcast team they’ve assembled, the construction blocking the view of the skyline outside the stadium, and the countless playoff failures, the 2018 version of this team is a complete disaster, even as it treads water at .500. Bryce Harper’s likely swan song includes him hitting .214, but may be most remembered for his failure to run out a double play ball in a loss to the lowly Mets on Saturday. The so-called face of the franchise is pouting his way into free agency. The body language of the other so-called elite players on this roster is always pessimistic. It doesn’t help that Daniel Murphy has one home run in 97 at-bats and they are dealing with some big injuries, most notably to Stephen Strasburg. The latest in a career full of hiccups, Strasburg’s reputation of being fragile is gaining almost legendary status. The bullpen has taken a step back with Sean Doolittle, a former Athletic, on the shelf (meanwhile, former Nats closer Blake Treinen is now an All-Star in Oakland). Ryan Zimmerman’s absence has further depleted this team of whatever little leadership it had. Washington is 11-22 in its last 33 games. Once again, the Nats, like most DC sports teams (the 2018 Capitals being the lone exception) have teased their fans with greatness, only to pull the rug out of from under them. This is a team with no identity, no fight, and really, no chance to win the National League East. The Philadelphia Phillies and Atlanta Braves are younger, hungrier, and if not more talented at the moment, certainly will be by next season. The juxtaposition between Melvin’s scrappy A’s and first-year manager Dave Martinez’s sad-sack Nationals is what makes baseball great. Apparent talent discrepancies don’t provide surprises nearly as often in football, basketball, or hockey, but baseball really is unique. Even though many people dispute it, baseball is the ultimate team sport, and team chemistry carries an incredible amount of weight. It’s equally if not more mental than its three other major counterparts. There’s no way to know at the moment if these trends will continue in the second half, but at the moment it’s so far so good for the A’s, and same old, same old for the Nationals. Be the first to comment on "Athletics, aka “Bizarro Nationals,” Steamroll Into Break"